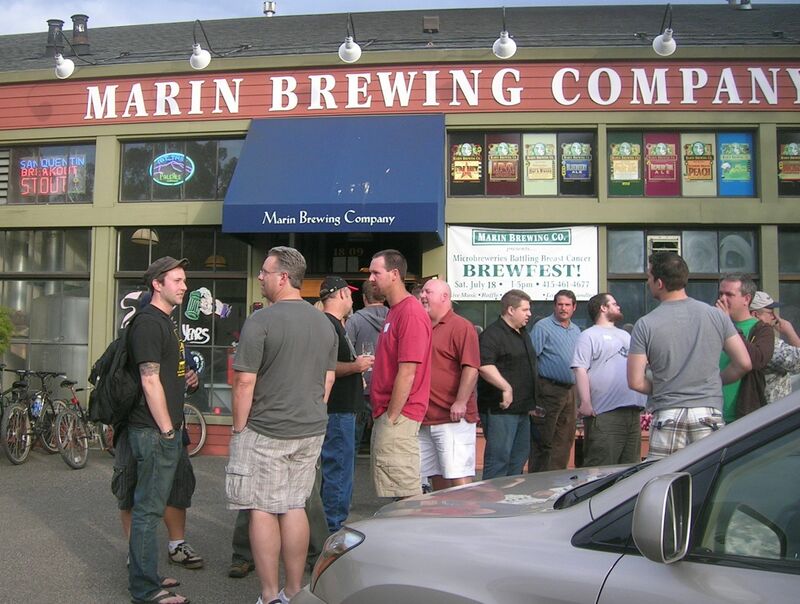 Marin Brewing Company is located in Larkspur, easy walking distance from the Ferry Terminal. MBC occupies a large building in the Larkspur Landing Shopping Center with a nice outdoor patio. They serve a wide array of their award winning beers on tap and sell bottles to take away. Marin is owned by the same owner as Moylan’s Brewery and Restaurant up highway 101 in Novato. Directions from BART: Exit the BART Station and head northeast to the foot of Market Street. Cross the Embarcadero to the Ferry Building. You can either walk through the building to the Bay and turn right to the Golden Gate Ferry Terminal, or turn right before entering the building and walk around the end towards the Bay. When you get to the Gandhi statue, go left to the ticket kiosk. When you get off the ferry in Larkspur, exit the terminal and walk north across the parking lot towards the busy Sir Francis Drake Boulevard. Cross SFD Blvd. via the pedestrian bridge into Larkspur Landing Shopping Center. There you will find the Marin Brewing Company. Open Brew day sounds amazing! I ******* love u guys!! Thank you for this website!! Thanks for the love, David. We do this for our love of craft beer, those who make and sell it and, of course those who drink it. It’s always great to to get love back.